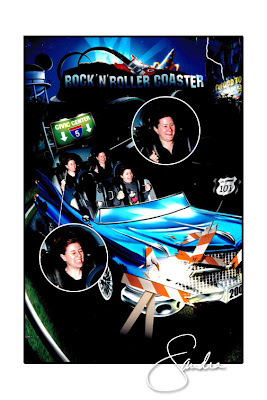 Brett and I aren't ride people but we were told the Aerosmith Roller Coaster was "a rush." The day before I considered the Mt. Everest roller coaster. Not sure why but the mountain looked so cool and from a distance, real. The closer I got to the ride the more I knew it wasn't for me. Anyway, our second day at Disney World we decided we were going to do the Aerosmith ride if it was the only ride we did. It was around 5:00 in the afternoon and we were excited. The thing about this ride is the whole thing is indoors so you have no idea what you're getting into. As you can see from the photo below I was frightened:) It's been a while since I've done anything other than the Tilta' Whirl and the bumper cars. The ride was only a minute or two and to be honest I was a little disappointed when it ended, even though it scared the pants off of me in the beginning. Brett too was a little weak in the knees when we got off but as you can see she enjoyed it. Sort of. Click on photo to get a larger view.